Aaron Miripol could make a killing on Wadsworth Station -- if he wanted to. He bought the two-story, 1970s-era 100-unit apartment complex just outside of downtown Denver for about $7 million back in 2012. Two years later, the city's new light rail system reached Wadsworth Station's doorstep, and eager investors seeking to buy the property came calling. "We could double our money," said Miripol, who heads an affordable housing development company called the Urban Land Conservancy. There's just one problem: The complex is home to working class families and retirees, public employees and healthcare workers, who couldn't afford the rent hikes that would likely follow after such a pricey sale. "None of the folks living there could stay," said Miripol. The tenants of Wadsworth Station are lucky exceptions. Seemingly overnight, Colorado's housing market has become unaffordable to many of the state's residents. 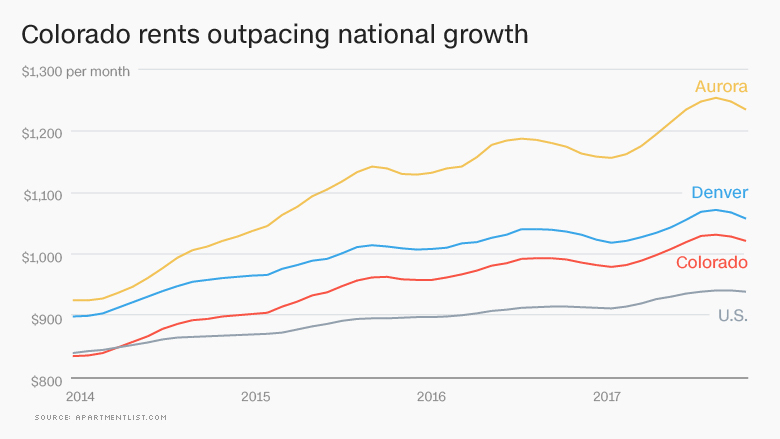 Typically, the housing shortages and sky-high rents seen in the state would only exist in tech and finance-heavy metropolises, like New York or San Francisco. But a sudden influx of new people has left Colorado unable to meet demand or help those who've been displaced. A recent report by government-backed mortgage giant Freddie Mac found that the amount of housing in Colorado that was affordable to people making less than half of the median income had plunged by more than 75% between 2010 and 2016 -- one of the biggest decreases in the country. 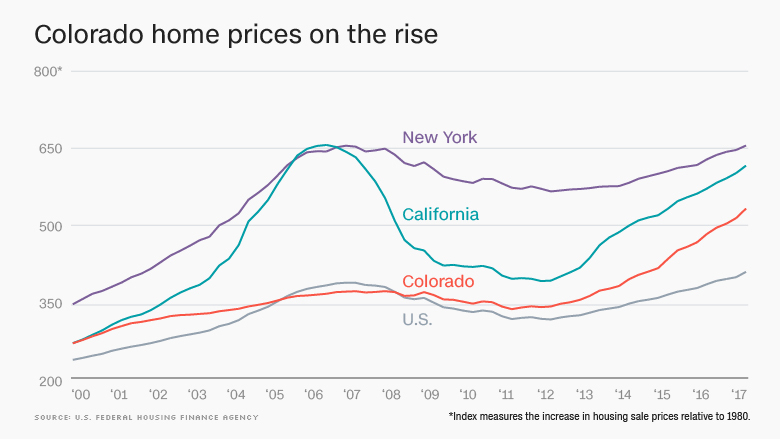 Colorado's home prices have started climbing as fast as high-cost coastal states. According to real estate site Apartmentlist.com, median rent for one-bedrooms in the state has risen 22.4% since the beginning of 2014 — twice the nationwide increase. Denver's rents now sit 12.6% above the national average. "Before we've realized it almost, we're a high cost housing city," says Ismael Guerrero, director of the Denver Housing Authority. "We're new to that club, but we're clearly there, because the wages haven't kept up." Some of the problems began during the recession, Guerrero and other housing experts say. Although Colorado hadn't overbuilt as badly as some other states during the housing bubble, it still suffered though the foreclosure crisis. Investors bought up homes and flipped them into higher-end rentals. At the same time, the state added about 570,000 net new people between 2009 and 2016, many of them coming for well-paid tech and oil jobs. But there just weren't enough homes to meet demand. Burned by the crash, banks were reluctant to make loans, developers were risk averse, and underwriting standards had become so strict that it kept many would-be home buyers from purchasing their first homes. The units that did get built targeted high-income tenants, leading to an oversupply of luxury apartments and boosting demand for anything less expensive. Amanda Friedman, 30, just moved to Denver from Baltimore in order to be closer to world-class rock climbing. She's got a job as a legal assistant, but is still looking for a place to live -- every apartment seems to have multiple applicants. "What has surprised me is how competitive the market is, like how quickly places are posted and have applications," Friedman says. "Even the crappy areas with someone looking for a roommate." Another big issue: That influx of newcomers didn't include enough construction workers. Even as construction wages have escalated, many workers still can't afford the high cost of housing and a years' long immigration crackdown has driven much of the state's construction workforce away. Developers and housing experts also blame building regulations, like height restrictions that protect views in mountain towns and a law that eased lawsuits against developers for shoddy construction, making it difficult to finance units for lower income homebuyers. Land prices have also risen, especially around the new transit lines. The average value of land with apartments on it has jumped 250% since 2010 in the seven-county metropolitan region around Denver, according to an analysis by researchers with Shift Research Lab and the Colorado Futures Center at Colorado State University. Communities near Denver's urban core are especially vulnerable. Home values in the gentrifying neighborhoods of Globeville and Elyria-Swansea escalated nearly 70% between 2013 and 2015, according to a report by the city. People who are displaced have been forced to move into surrounding areas, says Apartmentlist.com housing economist Chris Salviati. Historically high-cost cities, like San Francisco and New York, have mechanisms in place to deal with cost increases, like rent stabilization, zoning exceptions for developers who price some units below market rate, and dedicated government funding for construction of affordable housing, such as fees on real estate transactions. 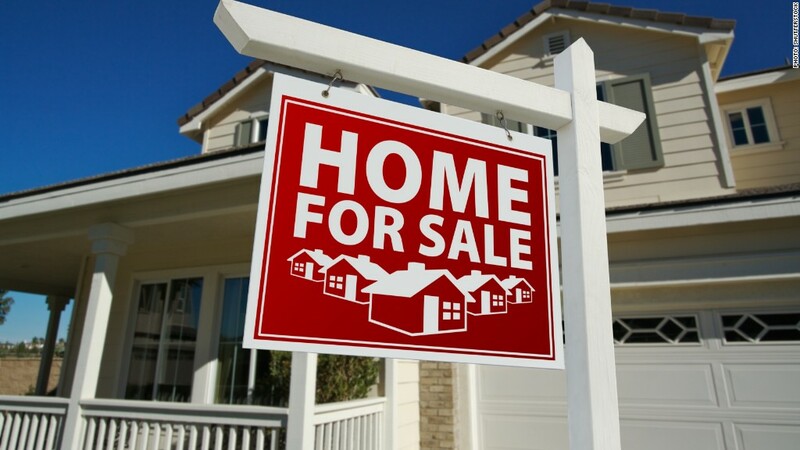 Related: Should you rent or buy a home? Until a couple of years ago, Colorado had none of those, says Jonathan Cappelli, director of the Neighborhood Development Collaborative, a coalition of non-profit developers. Colorado prohibits local rent control regulations and has capped residential property taxes, which limits the potential funding for affordable housing. "If you don't have rent control, and you don't have strong incentives for developing affordable housing, and you don't have a fund to fund it, you just don't have any tools," Cappelli says. Federal funding sources, which have been flat or declining in recent years, also don't stretch as far when housing costs rise. The Denver Housing Authority says it has access to 6,800 federally funded housing vouchers, but has only been able to dispense 6,000 of them, because each one costs more when rents are high. The same is true of the available pool of low income housing tax credits for developers, who can't build as much when construction and land acquisition costs rise. The state of Colorado has tried to supplement the shrinking pool of federal tax credits with its own housing tax credit program. Some Colorado cities are committing funds and political capital to fixing their housing affordability problem. Last year, Denver created a 10-year, $150 million fund to support affordable housing. In September, it put out a comprehensive housing plan proposing to strengthen its ordinances around affordable housing creation and preservation. The Denver Housing Authority is also in talks with landlords about make their excess luxury inventory available to low-income tenants at a discount, with a city-subsidized voucher. Advocates see these plans as a positive first step — but it still may not be enough. "We're just one of those places that has kind of caught fire," says Phyllis Resnick, lead economist at the Colorado Futures Center at Colorado State. "And we've seen it again and again, that when you catch fire, it kind of becomes a legacy problem."